Today officials at the University of Alberta will flip the proverbial switch and 40,000 students will get access to the university’s deployment of Google Apps for Education, a significant milestone for a journey that began back in November 2008. The U of A’s move to Gmail has been talked about for quite some time, but the switch is about more than just email. This is an important step toward building the IT campus of the future – a mobile, connected community of staff, students, faculty, and alumni. Our goal is to create the most mobile, connected academic community in Canada: anyone, anywhere, any time. You can learn more about the broader vision here in PDF. When Academic Information & Communication Technologies (AICT) was given the task of examining the University of Alberta’s email systems, they didn’t realize just how unwieldy email on campus had become over the years. With more than 80 mail servers spread across campus supporting nearly 150,000 accounts, it was definitely becoming difficult to audit, manage, and support. Six months after they began looking into the issue, AICT started exploring Gmail. In September 2009 the University of Alberta began legal discussions with Google, and over the next year negotiated the various contracts. There were lots of very valid concerns about privacy and security, and the university tackled those head on. There is no data mining, and there are no ads under the agreements that were finally signed in December 2010 (PDF). Jason Cobb, Issues & Communication Manager to the VPs at the University of Alberta, explained some of the driving forces behind the migration to Google Apps. Improving the quality of the experience was really important, as was improving security. The shift will enable the university to reduce infrastructure costs, which should lead to some broader cost savings (he noted that no positions would be lost) and some productivity gains, as the mundane task of managing email can now be removed. “Most importantly, we’re trying to be transformational, not just transitional,” Jason told me. That means enabling collaboration in ways that just weren’t possible without a system like Google Apps. That’s why the U of A is adopting the full suite of apps, rather than just Gmail. Other universities around the world have adopted Google Apps for Education of course, but the U of A is definitely one of the biggest to take on a project of this scope. Many other Canadian universities are now understandably interested in following the U of A’s lead (and Google is no doubt keen to see that happen as well). You can bet they’ll be paying close attention to the rollout. The 80 mail servers that AICT identified are generally broken up by subdomain. Central Mail refers to the default @ualberta.ca account that all students receive, while many faculties and departments have managed their own email on separate servers, with addresses such as @cs.ualberta.ca (for the Computing Sciences department). The switch today starts with Central Mail. Students will follow a simple three-step process to convert their email to Gmail. The first step is to understand and agree to the terms and conditions. The second step is to activate the Google Apps account, which will cause all new email sent to the student’s email account to appear in Gmail rather than in Central Mail. And the third step is to migrate any old emails into the new system (a process which can take a few hours). 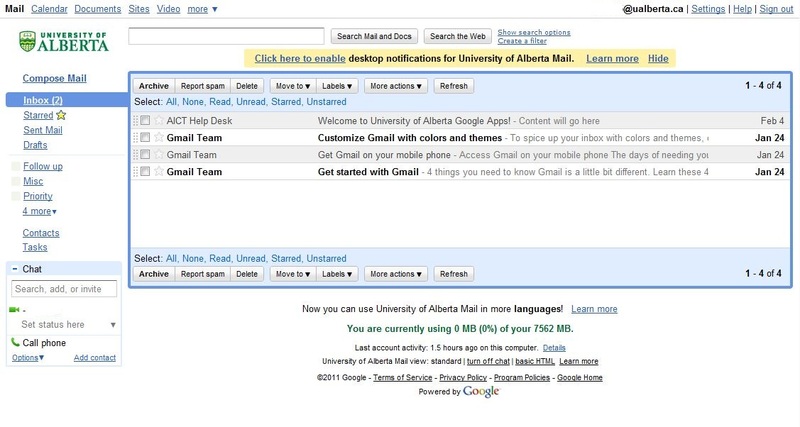 Students retain the exact same @ualberta.ca email address, and automatically get access to the other pieces of Google Apps such as Calendar, Documents, Chat, Groups, and more. They have the choice of switching for now – in October, Central Mail is scheduled to become read-only and students will have to switch at that point. After completing the switch and logging in, students will be presented with the “launch pad” that will serve as the entry-point to Gmail and the other apps. When Simon Collier, Network Administrator with AICT, demoed the system for me last week, he wasn’t quite sure what to show! It really is just Gmail. The only differences are the University of Alberta logo and the lack of ads (it looks like there are one-line ads above the inbox, but those are actually RSS feeds…AICT chose to leave them enabled so that students have the option of turning the feature on or off). The U of A has done some interesting things to make this happen. They’ve implemented single sign on, which has been rolled out for BearTracks as well. This means that Google never actually gets the user’s password, they just get a one-way hash. Security remains entirely within the University of Alberta. AICT has also done some work to make the migration process possible. Initially, they tested a migration tool hosted by Google and calculated that it would take two and a half years to migrate everything! That was unacceptable obviously, so they found another way. Now the university hosts the migration tool, and they estimate it would take just two to three weeks to migrate everything. How much data are we talking? As of mid-February, Central Mail was home to more than 228 million messages, taking up approximately 30 terabytes of space! The next phase of the project is to migrate the other mail servers. It’s a more difficult task, because there is more business process involved. The migration will start right away with a staggered list based on failing hardware, age of hardware, business needs, and other factors. The goal is to have the vast majority of users migrated to Google Apps within a year, and to have everything completely migrated within 18 months. The new system supports collaboration in a variety of ways. One of the simplest features is auto-complete on the “to” line when composing an email. Start typing a name and you’ll see matches from the entire campus directory! 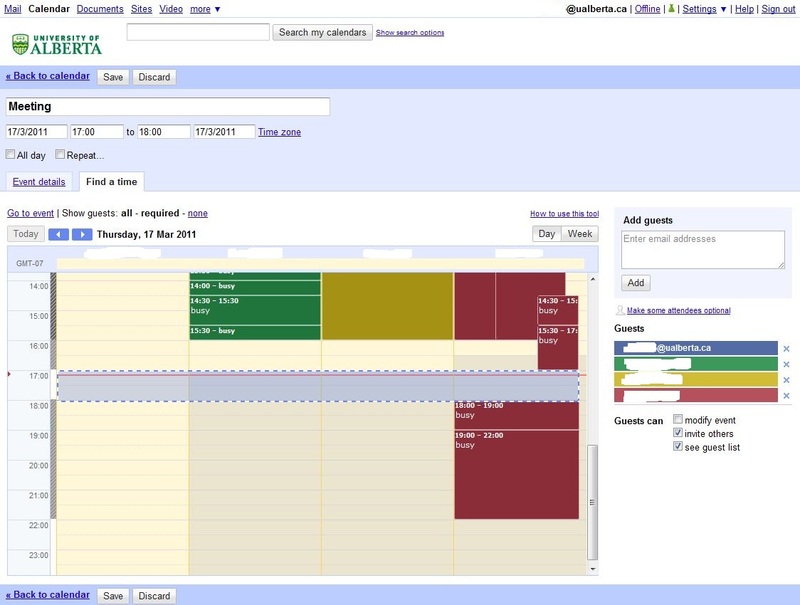 Likewise, you can now pull up anyone’s free/busy status in the calendar, which Jason emphasized will make scheduling meetings much simpler than in the past. The ability to share and edit documents using Google Docs is another big win for collaboration, especially given the new discussion features that Google recently introduced. It’s not hard to see how this can be expanded in the future. Closer integration with BearTracks is something AICT is working on, so you can imagine registering for your courses and having your calendar get updated automatically. Perhaps students could be added to automatically created Groups for each of their courses. There’s a lot of opportunity to build atop the platform, and work is already underway to examine the possibilities. We can’t be evolutionary in the changes that need to happen to our core IT infrastructure; we must be revolutionary. We must position ourselves to support the mobile, connected IT campus of the not-so-distant future, else we run the risk of being regarded as increasingly irrelevant to the needs of our students, staff and faculty. It’s exciting to see the University of Alberta moving so boldly to make this vision a reality! UPDATE: Here’s the official U of A post on the switch. UPDATE2: Here’s the official Google Enterprise post on the adoption of Google Apps.